Social psychologist Dr Stefania Paolini aims to understand the complex decision making processes involved in engaging with 'otherness'. Dr Stefania Paolini is interested in what creates, or ameliorates, prejudice, discrimination and stereotyping between groups on opposing sides of an issue. "My research expertise is around looking at how being part of a group impacts on the way you approach the world more broadly, and the way you respond to people who are from groups different to yours," she explains. "There are many bases of prejudice. It could be sexual orientation, ethnicity, gender, or religion. Some of these divisions are quite benign, but others obviously create a lot of social issues." Understanding why people choose to interact with members of other groups, why they choose not to, and under what conditions interactions challenge existing beliefs – for the better or for the worse – may hold the key to prejudice reduction and improved social integration. Stefania notes that the academic and political lineage of her research is very much anchored in the push for desegregation in the United States during the 1940s and 1950s. In 1954, renowned American personality psychologist Gordon Allport published his highly influential tome, "The Nature of Prejudice", shaping the literature in this field. Allport's book explores the inherent internal conflicts that lead to societally mandated prejudice, directly informing monumental positive policy change related to desegregation. Growing up in working class Italy, Stefania observed with interest the manifestations of inner conflict, the observance of co-existent but seemingly contradictory beliefs. Her interest in social and intergroup psychology ignited early in her undergraduate studies at the University of Padova. Pursuing her PhD at Cardiff University under the tutelage of acclaimed social psychologist Professor Miles Hewstone (now at Oxford University), Stefania's doctoral research focused on intergroup relations between Catholics and Protestants in Northern Ireland. The resultant empirical work showed that direct and indirect cross-group friendships between Catholics and Protestants were associated with reduced anxiety, translating into reduced prejudice. In addition to being incorporated into reports by the UK Equality and Human Rights Commission and the British Labour Party's Fabian Society, a 2004 article publishing these findings has also received more than 380 citations. As one of the first studies to look at the role of friendship across the group divider in prejudice reduction, the results were also widely cited in the media. Allport's work, and much of the subsequent literature in this field, espouses the idea that facilitating contact between groups – such as Catholics and Protestants in Northern Ireland or Muslim and non-Muslim in Australia – is the best way of improving relations. In 2005, Stefania was handpicked to present to a small delegation of intergroup psychology experts commemorating the fifty-year anniversary of a trip to South Africa undertaken by Gordon Allport and his PhD protégé Thomas Pettigrew. It was in this atmosphere of reverent celebration that Stefania unveiled her latest research. Her work, since reinforced by data from an increasing number of international studies, suggested that unless carefully controlled and definitely positive, such contact is more likely to confirm existing bias, increasing conflict. "I was invited because I had shown that friendships across the protestant catholic line are good", she remembers. "But I was presenting this new pile of data that showed that while positive contact is good, negative contact is far more powerful." "There is greater potential for things to go wrong than going right when people meet, because people start with a negative expectation about the others." This revolutionary understanding of intergroup contact, its unwanted effects and the subsequent implications for public policy, have created controversy within the field and attracted a number of vocal critics to Stefania, as well as important allies. Stefania's ultimate aim is to understand the motivators related to intergroup contact, so as to inform public strategies related to increased social integration. "Although we know that anxiety is a big contributor to preventing people from engaging with others, we don't know much about why some people push through, especially when the conditions outside are not favourable." Stefania affirms that research in several fields has shown that anxiety, easily triggered, is a dominant response to a perceived threat to survival. And although this function was helpful as a survival mechanism during the evolution of humankind, it is now apt to preclude social integration. "Breaking through that fear requires thinking that there is an alternative possibility, a reality that isn't available, that things can be different." "What I am interested in, is what is in the brain of people, who despite feeling the fear and anxiety for 'otherness', still push through." "I call these people intergroup brave." The benefits that can be created by positive interactions between people of opposing groups, such as increased social integration, health, and productivity, are often forestalled as people actively avoid intergroup contact. Just as she is interested in the courageous who despite fear, engage in intergroup contact, Stefania is also seeking to understand the avoiders. "Research suggests that people who are avoidant seem similar to people with more prejudicial attitudes, but when they engage, they change much more than the others." With ARC Discovery Project funding, Stefania has recently begun a new project, in collaboration with UON students and international experts on intergroup related anxiety, communication, and psychology. The team will explore this contact approach avoidance. 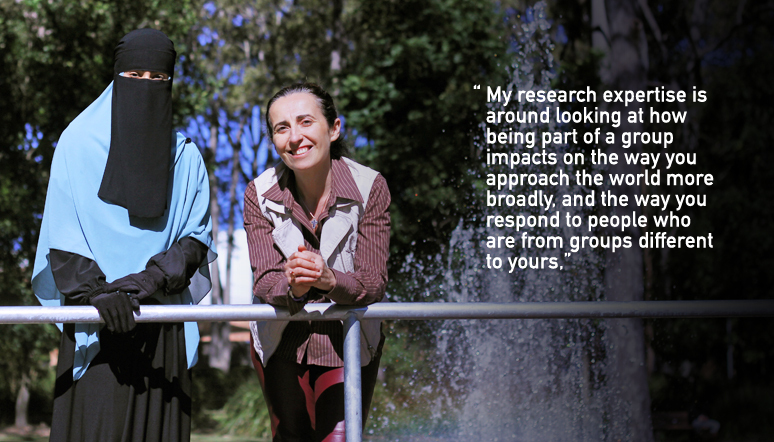 For the first study of the project, Stefania is working closely with a Muslim Honours student who was running a hijab stall one day a week for four weeks on the Callaghan campus of the University of Newcastle. Non-Muslim women were asked if they were interested in learning more about why the hijab and other head coverings such as the niqab (face-veil) are worn in the Islamic faith, and if they wanted to try any of these Islamic clothes on within the stall or to wear around campus. Purposefully challenging dominant cultural norms on campus, Stefania and her team will collect and analyse data related to the decision-making of those who choose to, or choose not to, participate. "We can learn just as much from the people who don't want to be involved as we can from those who do," she confirms. Although informed by previous work related to courage, Stefania is viewing this study, which connects these understandings of overcoming fear to intergroup relations, as a first step into a new frontier of social psychology. "We are trying to understand what the bases are to predict where people fall in this spectrum of intergroup indifference – fearfulness, bravery, fearlessness – in the context of this hijab stall," Stefania explains. "This will be the first study in this line of work. We've spent a lot of time preparing the study, because we are also preparing the template methodology for this line of research." "Although exploratory, this research is based on the very strong foundation that comes from understanding that there are pulls and pushes. It is not at all a straightforward decision. It is very complex and nuanced." "You may display very oppositional responses depending on the push, what is triggering you. It is not that part of you is more true than the other parts, but we are all made up of contrasting push and pulls."